Gold, plain and simple, is financial-catastrophe insurance. The thing is, we haven't had a financial catastrophe in a decade. So gold is cheap today. For the masses to pile into gold, they need to believe that we are at war. They need to believe that our nation is at risk. They need to believe that the dollar is going to fall and that inflation is going to appear. And most important, they need to believe that the men at the controls are no longer in control. Since September 11, 2001, the world has changed. We have fear. We have war. We have wartime government spending on defense. The stock market is falling and so is the dollar. It's time to buy some calamity insurance – and that means gold. Gold was trading at $320 an ounce when I wrote that. Over the next decade, it soared to $1,900 an ounce. We haven't had a financial catastrophe in a decade. We don't have inflation or a major war. So we're back to the 2001 mentality about gold. Nobody cares about it. Meanwhile, if Jim Rogers is right and we do careen toward financial catastrophe after the Melt Up, then gold should absolutely soar. Gold is at about $1,200 as I write – down roughly $700 from its 2011 peak. Junior gold mining stocks have fared even worse. GDXJ – the main junior gold-stock exchange-traded fund ("ETF") – is down about 80% today from its 2011 peak. The last time gold was this hated – in late 2001 – the major gold-stock index (the HUI Gold BUGS Index) soared by nearly 300% in a little more than two years. While I can't promise you 300% gains in two years today, I can tell you that the setup today in gold is the same as what we saw back in late 2001. The outcome could be similar, too. Gold and gold stocks could make investors a few times their money. This week, for the first time in years – and for only the second time in my long career – I'm personally buying gold stocks again. And I'm also doubling the amount of the physical gold I own. In short, I am putting my money where my mouth is. Why? This strategy works in just about every type of asset... The most important question to answer is, "How do you define these terms for different assets?" The best way to see that in gold is to look at what large speculators in the futures markets are doing with their money. For that, we look at the Commitment of Traders ("COT") report. It shows the real-money bets of futures traders. This is EXACTLY what I want to see. 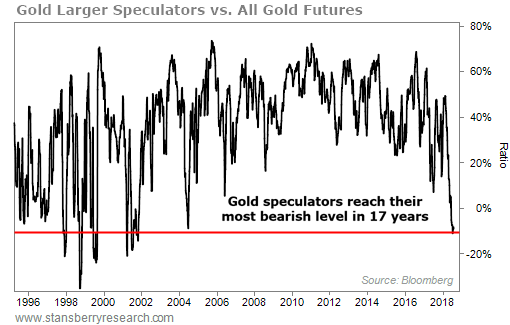 As the chart shows, gold speculators are betting against gold to a greater degree than at any time since 2001. As you know, gold's great bull market started in 2001, from a similar degree of "hated." And as you know, gold stocks soared starting around that time. I expect today's extreme means that we are close to the start of the next great bull market in gold. Buying our favorite "leveraged" way to play gold – which led to a massive 995% gain after I recommended it in 2002. Buying the premier play on precious metals mining royalties at an amazing value. If you are a longtime reader, then you are already familiar with Nos. 1 and 2 on this list. And I'll explain more about how we'll use these ideas to capture today's opportunity a little later on. Most folks aren't aware of it. But it's an open secret in the gold industry. The gold mining industry needs money. And these shadow bankers provide it – in what is the best business model I've ever seen. The main job of this business is – no kidding – simply going to the bank and cashing checks. Gold mining is incredibly risky most of the time. Finding gold takes talent. That's the job of exploration companies. They go out with scrappy geological teams to scour the earth for mineral deposits, conducting estimates and studies. It takes expertise, persistence, and a lot of luck. These companies are looking for the literal pot of gold at the end of the rainbow. Most of them never succeed. But when they do, they need help. Explorers aren't set up to convert their discoveries into mines. They need outside financing. That's where this month's recommendation comes in... after the hard work of finding the gold has already been done. It's what we call a gold royalty company. Here's what these companies do... They cut a big check. They help the miners get the gold out of the ground. And in exchange, they get a cut of the profits. They do no mining. They spread their investments across only the best projects. It really is the optimal way to take advantage of a rising gold price – without risking going out of business because of a falling gold price. The secret gold banker I'll share with you today is trading for near the cheapest it's been in many years (except for one extreme moment a couple years ago). But nobody cares. All that most investors see is that the price of gold is down, and so they move along. Meanwhile, you have the opportunity to own part of the gold production of the world's best producing gold mines. This gold banker has the potential to deliver hundreds-of-percent returns when the price of gold rises... as history has proved multiple times. Instead of being a regular boom-and-bust gold miner, Royal Gold takes a unique approach. It buys minority stakes in gold projects that major gold miners operate. Again, in simple terms, the company invests in projects and then earns royalties on the gold produced from those mines. Essentially, Royal Gold's business model is to make investments. Then, the company simply drives to the bank and cashes its checks. Sure, Royal Gold's cash flows rise and fall with gold prices. But the company isn't putting up huge sums of money until a mine is a "sure thing." It invests later in the game, when it's safer to do so. And it just keeps earning money... almost regardless of what happens with gold prices. This makes for a safer investment. But it gets better than that... You see, Royal Gold is invested in a globally diversified basket of the best projects on Earth. The company's current portfolio includes 39 producing mines and another 22 in development. It also owns a stake in more than 100 exploration- and evaluation-stage properties. One of Royal Gold's most valuable royalties is on the Peñasquito mine in Mexico. The company owns a 2% royalty on the mine, which features some of the world's largest gold, silver, zinc, and lead reserves. This is an open-surface mine that contains nearly 9 million ounces of gold reserves and more than 500 million ounces of silver reserves. It also has more than 3.5 billion pounds of lead reserves and nearly 8 billion pounds of zinc reserves. Mining giant Goldcorp (GG) runs the operation and assumes all the risk with it. Royal Gold simply sits back and collects a 2% royalty on all of the gold, silver, lead, and zinc that comes out of the ground. Another of Royal Gold's major investments is the Pueblo Viejo mine in the Dominican Republic. This is another open-surface mine with huge gold and silver reserves... The site contains about 7 million ounces of gold and more than 45 million ounces of silver. This project operates on a different structure for Royal Gold, but it's another good one. The company pays a percentage of the spot price for each ounce of gold and silver mined. That ensures it'll earn a profit as long as the prices of the metals don't drop too far. Gold majors Barrick Gold (ABX) and Goldcorp operate the mine. Meanwhile, Royal Gold collects 7.5% royalties on the gold that's mined, paying 30% of the current spot price. And it collects 75% on the silver that's currently mined – again at 30% of the spot price for the metal. The only way things would go badly for Royal Gold would be if the Pueblo Viejo mine were to close... But Barrick and Goldcorp stand to lose much more than Royal Gold if that were to happen. So those two companies will do whatever it takes to keep things moving along successfully. Royal Gold controls a stake in dozens of other projects, but these examples should make it clear that the company has its fingers in gold projects all over the world. The company also operates a superior business model... leaving the mining risk to others. Finding a superior business isn't enough. Once you do that – like we have with Royal Gold – you've still got to buy it at the right time. Not surprisingly, the right time to buy Royal Gold is also the right time to buy gold. And gold is completely hated right now, as I shared above. That negative sentiment is giving us a unique opportunity in shares of Royal Gold. The company is dirt-cheap right now. To see it, we need to figure out the right way to value a royalty business. I spent a lot of time figuring this out earlier in my career. And the solution is quite simple. The stock market tends to value royalty businesses as a multiple of their royalty incomes. In the case of Royal Gold, a fair value is around 16 times royalty income. If we can buy it for less than that, we're doing great. The black line is Royal Gold's market value. The blue line is Royal Gold's fair value – the market value it would have if it traded for 16 times royalties. You can see that the blue line tends to line up pretty darn well with the black line. 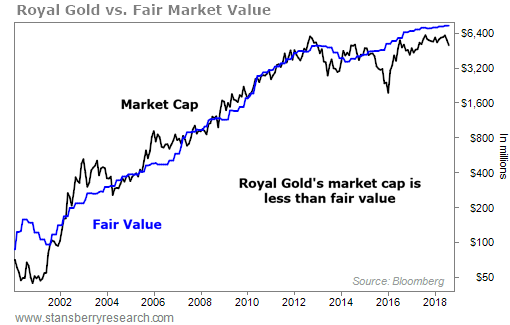 Royal Gold usually trades near fair value... But things get out of whack every now and then. Every once in a while, the company trades for a lot more or a lot less than fair value. And right now, Royal Gold is fantastically cheap based on this measure. A reading of zero means Royal Gold is trading for 16 times royalties (it's trading for fair value). Anything below that means the company trades for a discount (it's cheap). Right now, the company trades for a 32% discount to fair value. That's one of the largest discounts we've seen over its history. And it means the company would have to soar just to move toward a reasonable valuation. I'm not kidding here. 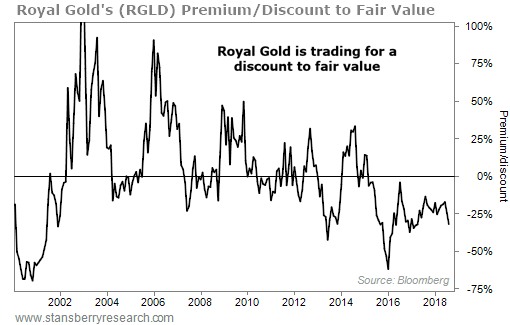 From a 32% discount, Royal Gold would have to jump around 50% just to hit fair value. And as the chart above shows, the company has spent plenty of time above fair value in the past. This also assumes the price of gold goes nowhere. But higher gold prices are likely, given today's extreme sentiment. This gives us several ways to make money. Royal Gold should soar right alongside gold. And as gold rises and negative sentiment reverses, the company's big discount could turn into a big premium. I wouldn't be surprised to see Royal Gold jump triple digits over the next 12 to 18 months as this unfolds. That's not even a wild claim. It's realistic, given where we are right now. Of course, this won't work out if gold prices don't start to go up. That's the real risk we're taking right now. But I'm happy to make that bet. Buy Royal Gold (Nasdaq: RGLD) today. We'll plan to hold for one to two years. To protect our downside, we'll use a VQ% Trailing Stop from TradeStops. I think of shares of Seabridge Gold (NYSE: SA) as the ultimate "Golden Lottery Ticket." When the price of gold enters a great bull market, shares of Seabridge can make you feel like you just won the lottery. For example, after gold bottomed in 2001, Seabridge shares soared nearly 7,000% by March 2008. From 2015 to 2016, the price of gold moved 21%. And Seabridge soared 300%. We want to be in on those massive gains when the price of gold goes up. The thing is, Seabridge shares are even better than a lottery ticket... because they are a lottery ticket on gold that never expires. I first visited Seabridge's Mitchell project in July 2015. My lead analyst Brett Eversole, Seabridge CEO Rudi Fronk, and I flew by helicopter to the site in British Columbia. When we got there, Brett and I just stood for a minute, taking everything in. I had one thought: "This place is ultimately going to be bigger than the Super Pit." Up until that point, the Super Pit was the biggest manmade thing I'd ever seen. It's a mine in Australia's desert, two miles long and nearly half a mile deep. Unlike China's Great Wall, you can actually see the Super Pit mine from space. And the scale of the Mitchell project, to me, eclipsed it. Yet Mitchell is just the letter "M" in an acronym for Seabridge's biggest project: KSM. While Mitchell is one-third of the name, it's actually one-fourth of the project... The other two regions in the acronym are Kerr and Sulphurets. But Seabridge has also found even better grades of copper and gold in the peak next to Mitchell, called Iron Cap. The amount of gold and copper here is extraordinary. The Seabridge story goes beyond KSM, too... Seabridge owns Canada's second-largest undeveloped gold project as well. And it owns more projects nearby. Incredibly, the current market value of Seabridge Gold is just about $700 million. That means we can buy $89 billion in assets for less than $1 billion. But Seabridge hasn't entered production yet. It's busy finding more and more gold. Seabridge is one of the exploration companies I mentioned earlier, using all that talent and work to find massive gold reserves. It's a tough business. But when these companies strike it big, the rewards are incredible... And Seabridge is there today. Back then, Seabridge had just 9 million ounces of gold in the ground in the "measured and indicated" resources category. Today, it's sitting on more than 61 million ounces of measured and indicated resources of gold, and 45 million ounces of that is in the "proven and probable reserves" category. The growth in reserves has been extraordinary since I first started writing about it. So it's astounding to me that you can buy Seabridge shares today for the same price they sold for 12 years ago, back in 2006. Gold is primed to move. It's at its most extreme level in more than a decade. When it does – if history repeats itself – shares of Seabridge Gold should move a lot more. Buy Seabridge Gold (NYSE: SA) today. Plan to hold as long as the coming gold boom plays out. To protect our downside, we'll track the position with a VQ% Trailing Stop from TradeStops. Crux note: Gold might look especially attractive today, but Steve knows dozens of ways to make money in the markets today... And he's sharing them with his subscribers every month. So if you're an independent investor looking to take the next step, try a 100% risk-free subscription to Steve's True Wealth advisory. Click here to learn more.